This book will enable you to take your PHP development skills to an enterprise level by teaching you the skills and tools necessary to write maintainable and efficient code. You will learn how to perform activities such as unit testing, enforcing coding standards, automating deployment, and interactive debugging using tools created for PHP developers - all the information in one place. Your code will be more maintainable, efficient, and self-documented. From the design phase to actually deploying the application, you will learn concepts and apply them using the best-of-breed tools available in PHP. Specifically, you will learn to design an application with UML, code it in Eclipse with PDT, document it with phpDocumentor, debug it interactively with Xdebug, test it by writing PHPUnit tests, manage source code in Subversion, speed up development and increase stability by using Zend Framework, pull everything together using continuous integration, and deploy the application automatically with Phing - all in one book. 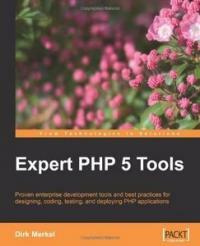 The author's experience in PHP development enables him to share insights on using enterprise tools, in a clear and friendly way.